We are living in a world which constantly changes which means that we must be able to change and evolve to follow the surrounding world. Today there is a high focus on what is often called the “Digital Journey” in the meaning of ensuring that businesses can meet the demand from mobile devices (App), internet of things (IoT), robotic process automation (RPA), artificial intelligence (AI) and any other acronym to describe human and machine interaction. One of the main components of the digital journey is integration; it’s all about integration. To have the right information at the right place, at the right time, and at the right cost is essential for business success. Why? It is with information that you do your business. If the information is not correct, everything will obviously fail. If the business doesn’t get the right information expected from the IT department at the right time, the business will most likely take the matter into own hands and that means a risk for shadow IT. This is dangerous – since there will be systems built and used within the organization without explicit organizational approval regarding requirements for control, documentation, security, reliability, etc. Data is moved and stored in various applications and will expose the organisation to great risks in the form of legal infringements and loss of sensitive information. The same risk goes if the cost is too high. That again will most likely make the business go around the IT department and choose shadow IT instead. All in all, the right way must be the easy way. That’s the only way to prevent shadow IT. So – if the IT department is too slow to provide the business with the right information at the right time – there must be a way for the business to collect the information they need themselves when they need it. And there is a way – it's called API. The APIs are like a window to the data that you want to share. Building those kind of windows makes it possible for anyone who needs the data to collect it – right when they need it. It’s self-service at it’s best. Although having APIs does not ensure a smooth and simple digital journey, we have found that with the help of APIs we can ensure that our customers minimize time and cost by often more than 50%. The time for API is here – the organizations are ready for it! APIs have been around for many years without being perceived as a saviour or silver-bullet, so what is the change? Sure – the technology is a big factor. Today the technology is much simpler and it’s easier from the self-service aspect. Only a few technicians are needed to provide the information in the first stage – the rest of the work is done by the end user. But I would like to state that it is not as much a technology shift as it is a major culture change. What we are seeing now is a change in how we work with our integrations, where the work is done and by whom. We have changed focus from the inside-out perspective to actually look at the demand from the business. This enables us to provide the information to the business in a self-service manner. Though minimizing cost is always positive and a quicker time to market can often be the difference between making and breaking, it is of utmost importance that it is done in the right way and not by building technical debt. Taking small steps towards your goal and early identify the core APIs that will be of most value for your organization when proceeding your digital journey. API is all about making your applications communicate in a smooth and seamless way. Combining your internal data with the world outside your own box would give you much more valuable insights. It would give you a huge advantage in the digital journey. 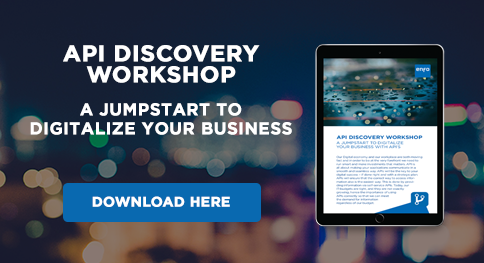 This is one of the reasons you should invest time in an API Discovery Workshop – to unleash the potential of data and communication in your organization. Interested? Read more about our API Discovery Workshop here!